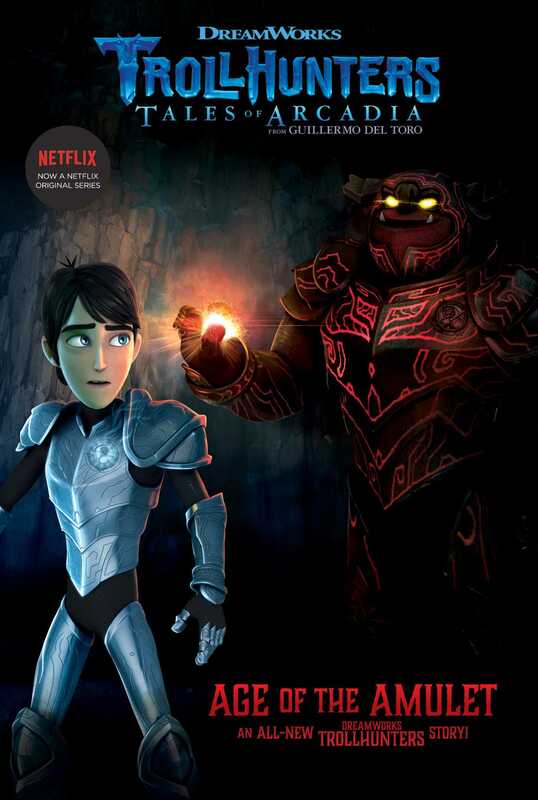 Jim travels back in time to meet some of the very first Trollhunters in this all-new epic story based on the hit Netflix series Trollhunters—from the limitless imagination of acclaimed filmmaker Guillermo del Toro and DreamWorks Animation. Jim travels back in time and encounters Gogun the Guardian, hailed as the bravest Trollhunter who ever lived. However, Jim is shocked to discover that Gogun is inept, unskilled, and terrified of everything and everyone. Jim knew when he was chosen as Trollhunter he would have to save mankind in the present, but he never realized he was responsible for the past as well. The fate of the world is a lot of responsibility for a fifteen-year-old—but luckily Jim is up to the task; as long as he’s home in time for dinner. “So, I’m guessing a refill’s out of the question?” asked Nomura. “I daresay your hospitality has lessened somewhat of late, Young Atlas,” Strickler said. “I see . . . ,” Strickler muttered, his eyes still downcast. “If she sees you here . . . if she remembers who I really am . . . it’ll break her heart all over again. And I’m not gonna let that happen,” Jim warned. Walter Strickler instantly transformed from his human guise into his true form—that of a tall, reptilian Changeling. Reaching under his cloak, Strickler retrieved a green fistful of feather darts and flung them at Jim. “Whoa!” Jim hollered, ducking the razor-sharp projectiles. Jim turned around just in time to see Nomura’s body morph into that of a lithe, purple Changeling. She snatched the meat cleaver and Santoku knife from the cutting board and hurled them at the Trollhunter. The Sword of Daylight manifested in Jim’s hand, and he used the flat of his blade to deflect the two knives. The Santoku lodged into the ceiling, but Strickler caught the cleaver and closed in on Jim. Nomura pulled two scythes from the scabbards on her back. Looks like close-quarters combat, thought Jim as he magically replaced the Sword of Daylight with his Glaives—a pair of curved throwing weapons, one in each of Jim’s hands. “This reminds me of the first time I was invited to dinner at your home,” Strickler joked. “Just imagine what Gunmar will do now that he’s out of the Darklands,” said Nomura. “Do you think he’ll hesitate to send every Gumm-Gumm at his disposal after you? Just because of the week—the month—the year you’ve had?” Strickler added sharply. Strickler and Nomura looked at each other, cocking their eyebrows in surprise. “Barbara?” Strickler whispered to himself. “Go! Through the back door!” Jim ordered. With that, Nomura adopted her human disguise and slinked into the twilit backyard. Strickler reluctantly followed, but hesitated at the threshold to address Jim one last time. In the kitchen, Jim wiped the sweat from his forehead with the back of his arm, only to be reminded that he was still holding the meat cleaver. And still wearing his armor. As Jim raced toward the knife block, Barbara threw her white doctor’s coat on the sofa. She crossed over to the dining room, missing the tail end of a mystical light show before she reached the kitchen and found her son. Jim stood ramrod straight in his normal clothes, a strained smile on his face and the Amulet tucked into his back pocket. “How was your day?” Barbara asked. “Uneventful?” said Jim, still sweating profusely. Barbara shrugged, removed her eyeglasses, and cleaned them with the fabric of her hospital scrubs. Jim looked to the heavens and allowed himself a small sigh of relief. That’s when he noticed the Santoku still wedged in the ceiling, directly over his mom’s head. With mounting dread, Jim saw the knife start to slip lower and lower, until it finally came loose and fell—right toward Barbara. She had barely put on her glasses before Jim yanked her forward. “Never, Mom,” Jim replied from the bottom of his heart. “I would say that sounds delish—” Barbara began before a buzz interrupted her. “This is Gun Robot. You have a text message,” announced Jim’s ringtone. JIMBO! COME QUICK!! YOU KNOW WHERE!!! “. . . to ruin my evening,” Jim finished under his breath. “What’s that, honey?” Barbara asked, not quite hearing that last part. “Or not,” Jim added, scrolling through the thousands of exclamation points Toby typed. “Actually . . . ,” Jim started, still scrolling through exclamation points. Jim immediately recognized that acronym. It was a secret code he and Toby used only in case of extreme emergencies. They came up with it after the time Jim wore a Grit-Shaka—a Troll relic that turned him into a carefree, albeit unbearably overconfident, jerk. “Why me?” Jim Lake Jr. asked of no one in particular.